Unlocking and surfacing inherent staff knowledge, building adaptability into teams, and putting more emphasis on customer retention are just some of the methods marketers from LinkedIn, Facebook and Google are adopting for digital marketing success. Speaking at the Marketo Executive breakfast event in Sydney, Linkedin head of marketing for A/NZ, Ben Eatwell, said buyer expectations of sellers have shifted dramatically thanks to digital connectivity. This is changing the way LinkedIn views its audience, as well as how sales and marketing teams communicate and are calibrated to achieve scale, he said. One way Eatwell is addressing this change is by tapping the internal knowledge of its people and providing a central point of collaboration. Other key priorities are agile thinking, testing and not being afraid of failure, Eatwell said. “In so many organisations, there’s a bias against taking intelligence risks in the organisation,” he continued. “In marketing, we can in a good position where we can drive… change and try new things. For Facebook head of technology, entertainment and communications, Jason Juma-Ross, talent must be top of mind for marketing teams heading into 2017. “It’s about education, learning and adaptability,”he said. According to Juma-Ross, one area marketers must work harder on is understanding business measurements, not just marketing proxies. “It’s not just the metrics we thought were useful to marketing 20 years ago,”he said. “We also all need a super healthy critical faculty that we apply to the old and new, and keep asking the hard questions to drive things forward. The other side of that is having the humility to accept new data points when they come through. Google head of industry sales strategy insights, Maureen Morris, said the focus needs to be on hiring skills not just for today, but for the future. And those are about adaptability and curiosity. “You can have all the best intentions to work cross-functionally, break down the silos and put the customer at the centre, but if the culture and incentives are not aligned with that, you’re going in opposite directions,” she said. “It just doesn’t work if you don’t have a culture that underpins the change you’re striving for. 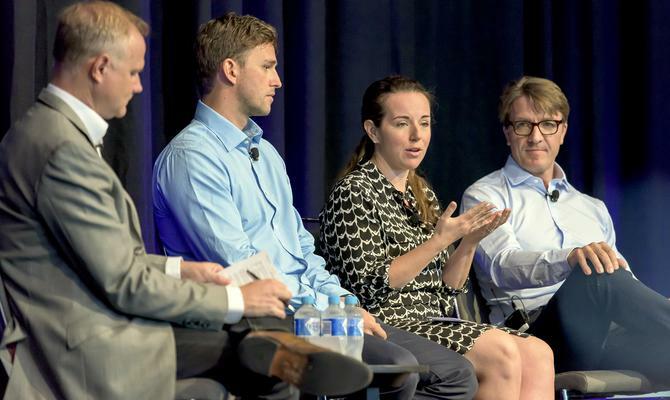 During the discussion, both panellists and speakers at the Marketo event highlighted the importance of shifting more dollars and thinking towards ongoing customer engagement, as opposed to pure acquisition. In his keynote presentation, Marketo managing director for Asia-Pacific, Bill Binch, said the quest of every marketer should be to acquire, grow and build the customer base of their organisation. Binch pointed to Gartner statistics that showed 55 per cent of current marketing spend is allocated to acquisition, 12 per cent on engagement, and 33 per cent on brand loyalty. “That’s the current way of thinking has been, but the new way of thinking… isn’t about a huge spike in spend where you’re trying to acquire customers then leave them to self-service, it’s about constant commitment to your customers to help them be successful,” he said. For Juma-Ross, that means striking the right balance between commercial decision making and customer-first thinking. “If you overindex on the commercial equation, you will lose customers and users,”he said. It also comes back to utilising tools and channels that best serve customers, rather than being distracted by the “shiny new toys”, Morris said. She claimed marketers are not taking full advantage of things consumers have fully adopted today, and pointed to mobile as an example. Juma-Ross agreed “brilliant basics” are a major gap many brands still need to scale. He advised marketers to focus on how to remove friction points for customers as their first step.